When Lincoln was going to attend a political meeting in Illinois he hired a horse from a political rival, who gave him a slow horse in the hope Lincoln would not not arrive on time. When he returned the horse, Lincoln said, "You keep this horse for funerals, don't you?" "Oh, no," replied the liveryman. "Well, I'm glad of that, for if you did you'd never get a corpse to the grave in time for the resurrection." In the summer of 1862 President Lincoln received a long letter from General McClellan in which Lincoln was advised how to conduct the affairs of the nation. When asked what reply he made to McClellan's letters, Lincoln said, "Nothing. But it made me think of the Irishman whose horse kicked up and caught his foot in the stirrup. "Arrah!' said he. 'If you are going to get on, I will get off.'" President Calvin Coolidge was often annoyed by his fellow Republican Senator Borah, of Idaho. 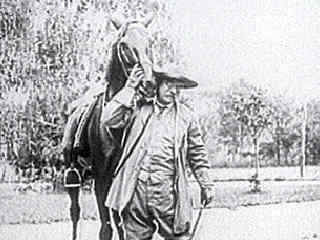 One day, while horseback riding with an aide in a Washington park, the aid pointed to another rider and asked: "Isn't that Senator Borah?" 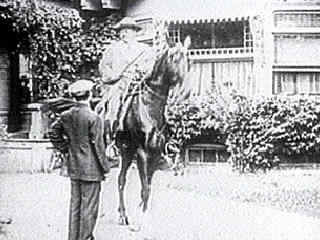 "Can't be," said Cal, "the rider and the horse are going in the same direction." During one of his campaign tours Theodore Roosevelt, a Republican, encountered a stubborn fellow who said that his grandfather was a Democrat, his father was a Democrat, and he was a Democrat, and he wasn't going to change. "Suppose," asked Mr. Roosevelt, "your grandfather and father were horse thieves? What then would you have been?" "In that case, I would have been a Republican." A man was hitchhiking across the country just prior to a past presidential election and had hit upon a technique for getting free drinks in bars by guessing which candidate was less popular and then loudly badmouthing them. He went into a bar in Colorado and yelled, "Carter is a horse's *rear-end*!" To his surprise, he was promptly thrown outside into the dirt. He picked himself up and went into another bar, shouting, "Reagan is a horse's *rear-end*!" Seconds later, he was eating dust again. Seeing a cowboy nearby, he called out, "Hey, fella! If this ain't Carter country and it ain't Reagan country, whose country is it?" The cowboy replied, "Son, this is horse country!" Q: What's the chief difference between a horse race and a political race? A: In a horse race the whole horse runs.